Every Windows 10 user needs to know about Event Viewer. Windows has had an Event Viewer for almost a decade. Few people know about it. 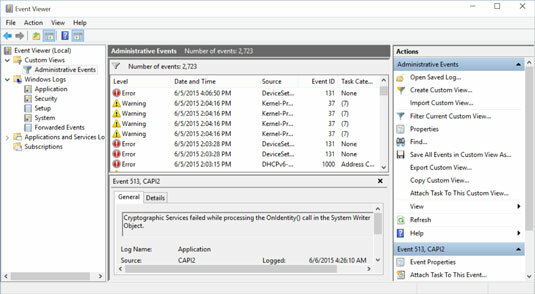 At its heart, the Event Viewer looks at a small handful of logs that Windows maintains on your PC. The logs are simple text files, written in XML format. Although you may think of Windows as having one Event Log file, in fact, there are many — Administrative, Operational, Analytic, and Debug, plus application log files. Every program that starts on your PC posts a notification in an Event Log, and every well-behaved program posts a notification before it stops. Every system access, security change, operating system twitch, hardware failure, and driver hiccup all end up in one or another Event Log. The Event Viewer scans those text log files, aggregates them, and puts a pretty interface on a deathly dull, voluminous set of machine-generated data. Think of Event Viewer as a database reporting program, where the underlying database is just a handful of simple flat text files. In theory, the Event Logs track “significant events” on your PC. In practice, the term “significant” is in the eyes of the beholder. Or programmer. In the normal course of, uh, events, few people ever need to look at any of the Event Logs. But if your PC starts to turn sour, the Event Viewer may give you important insight to the source of the problem. Right-click or tap and hold the Start icon. Choose Event Viewer. On the left, choose Event Viewer, Custom Views, Administrative Events. It may take a while, but eventually you see a list of notable events like the one shown. Even the best-kept system boasts reams of scary-looking error messages — hundreds, if not thousands of them. That’s normal. See the table for a breakdown. Events are logged by various parts of Windows. The Administrative Events log isn’t the only one you can see; it’s a distillation of the other event logs, with an emphasis on the kinds of things a mere human might want to see. Security events: They’re called “audits” and show the results of a security action. Results can be either successful or failed depending on the event, such as when a user tries to log on. Setup events: This primarily refers to domain controllers, which is something you don’t need to worry about.